When a person is addicted to a substance such as alcohol, illegal drugs, or prescription drugs, their addiction negatively impacts the people around them. If you’re married to an addict, your life may begin to unravel before your eyes and you may be left feeling helpless and hopeless. How do you know for sure if your spouse is addicted to a substance and what should you do about it? Addiction can put a strain on a marriage causing unpredictability, conflict, tension, and plenty of ups and downs. In some cases, it may not be apparent right away that your spouse is addicted, and signs of addiction may show up early in your marriage or out of the blue after many years together. As time goes on, you may come to realize that your spouse was addicted even before you got married but was very skilled at hiding it. Once you are aware that your spouse has a problem with substance use, one of the best things you can do is learn as much as you can about the disease of addiction. A person who has never abused substances can have a hard time understanding why someone can’t just decide to quit. You may feel that if your spouse loves you, he or she should be able to choose you over the drug of choice, but it’s not that simple. Addiction involves a strong compulsion to use substances in spite of harmful consequences. It isn’t likely your spouse will be able to overcome this compulsion through sheer willpower alone. Brain changes caused by repeated use of substances can make it very difficult to resist the intense urge to continue to use substances. It is possible to overcome addiction with treatment, but your spouse has to agree to get help. Your spouse may deny there is a problem, and attempting to force him or her to get help may make the situation worse. One of the most important steps you can take is to begin getting help for yourself. A good place to start is to attend meetings of Al-Anon, where you can learn more about addiction and how to stop enabling the addict or unintentionally encouraging addictive behavior. You may find that changing your own behavior may make a difference in the addict’s willingness to obtain treatment. People who are addicted very often believe they are only hurting themselves and that they are not hurting anyone else. You may find that even if you beg, plead, and threaten your spouse that you can’t take any more, he or she may refuse to acknowledge there is a problem and won’t go into treatment. The decision to leave or not to leave the marriage if your spouse refuses treatment is a personal one. The one thing you can do is get help for yourself by attending support groups for families of addicts, such as Al-Anon, or by talking to a therapist. 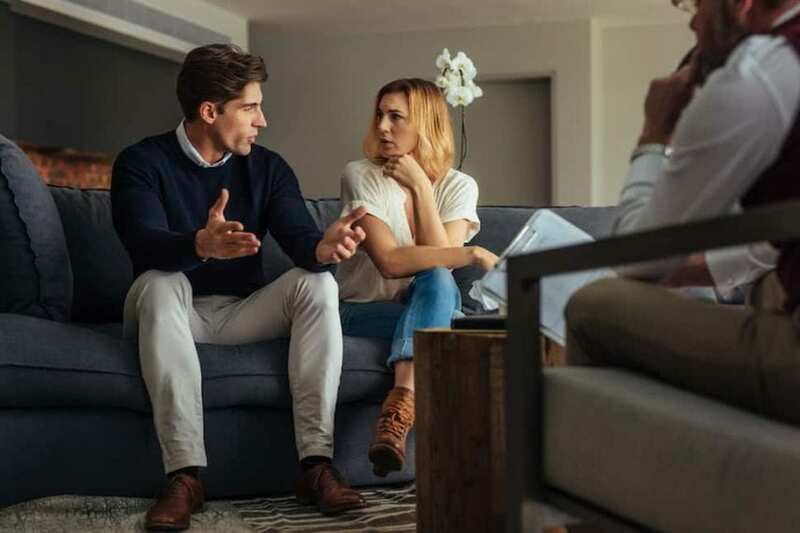 If your spouse acknowledges that there is a problem and is willing to get help, talk to your doctor or an addiction professional to find out the options for treatment. The best approach to treatment will depend on a variety of factors, including how long your spouse has been abusing substances and what substances have been used. Treatment may be done on an inpatient or an outpatient basis. If your spouse is physically addicted to any substances including alcohol, going through detoxification at an inpatient facility will allow medical professionals to supervise them during this process and keep them safe. Withdrawal can be accompanied by unpleasant and possibly fatal side effects, and a doctor can administer medications as needed to make your spouse more comfortable. Withdrawing from the substances is only the beginning of recovery. Your spouse will need to learn new coping skills for the stresses of life, develop a support network, and learn to deal with triggers and cravings that may come up in the future. In a residential treatment facility, your spouse will be able to begin this process in a safe and supportive environment free of everyday responsibilities. After going through a drug rehabilitation program, your spouse is not cured. Recovery will be ongoing for both you and your spouse and may include individual therapy, family therapy, and support groups. This is the beginning of a lifelong recovery journey. It is possible to live a good life as long as you both remain committed to sobriety and to the process of recovery.